“Cooking Light” had some impressive ways of using up leftovers from Thanksgiving. I was the most impressed with making ice cream out of leftover pumpkin pie! Many times, there is only one serving left and there is not enough from which to create another dish. If you save them in teeny, tiny containers, they get lost in the refrigerator only to reappear when you need the space for a Christmas dinner. Before cleaning up from the great feast, why not make a plate or two complete with all of the dishes. You could give the plate to your elderly next door neighbor, drop it off at a friend who is recovering from surgery, a college student, or as a lunch for a new mother. Wrap the plate in foil and put in a freezer bag. That gives them, or you, the option of just placing it in the freezer to be enjoyed at a later date. My TV room set up for Thanksgiving dinner. This entry was posted in Food, Give It Away and tagged Food, Giving by Frugal Fish. Bookmark the permalink. Lovely idea and a beautiful table! You are blessed to have that many to share the holiday with. Happy thanksgiving! I am so glad you commented! I was thinking of my dad who no longer sits at the head of the table and forgot to be thankful for all of those who still gather around it. His empty chair was filled when my granddaughter was born. I hope you had a lovely Thanksgiving. 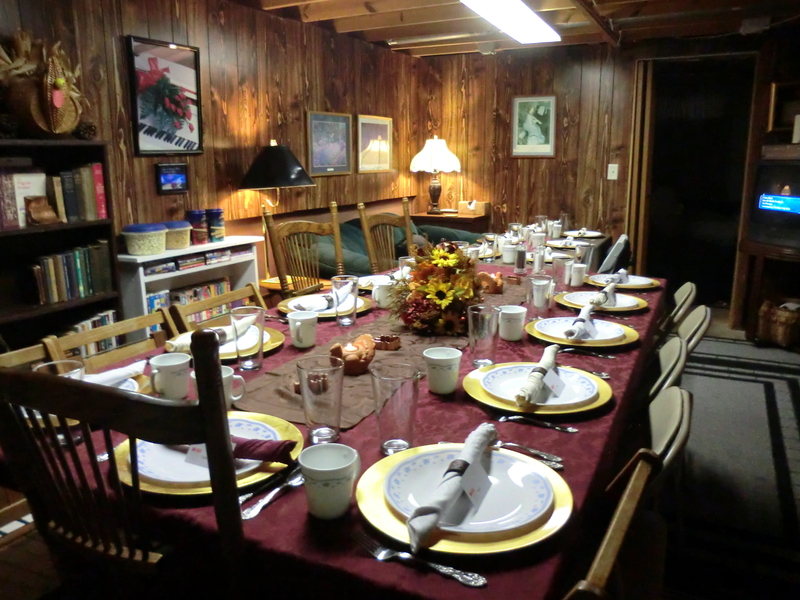 We celebrated our Canadian Thanksgiving in October and I felt very blessed and thankful. It’s so wonderful to have little ones breathe new life into family. We celebrated my nephew’s first thanksgiving (and sister’s first baby) this year and that made it extra special!